Skill + 1UP: Look back over your last year of projects and compare where you are in terms of skill and knowledge of your craft to this time last year. When I thought over the last year’s worth of learning I realized I had accomplished quite a few “new” things, but nothing jumped out as particularly noteworthy on its own. I began to realize the most monumental leap in my knitting life this past year was actually a conceptual and professional shift – I learned the craft of designing and writing patterns. A year ago, I made up my mind to become a hand-knitwear designer. I had been bouncing around from knitting, to weaving, to photography and back again, as career paths. When the dynamics of skill, baby care and working from home settled down, the logical choice seemed to be in knitting. As most artists find, my inspiration came from my own life’s adventure, and a special event for a very special little girl – my daughter’s first birthday. Almost exactly one year ago, I started the work on “Lil’ One’s First Birthday Dress“. Today, one year later, the dress pattern has been added to my ravelry store: “My First Princess Dress” is now a reality. The pattern is named after my own childhood fancy dresses which my Granny sewed up for me every year for Christmas and were nicknamed “Princess Dress” each year. (More about that on Friday.) The pattern includes all the details for lace borders, cabled bodice and darling puff sleeves. 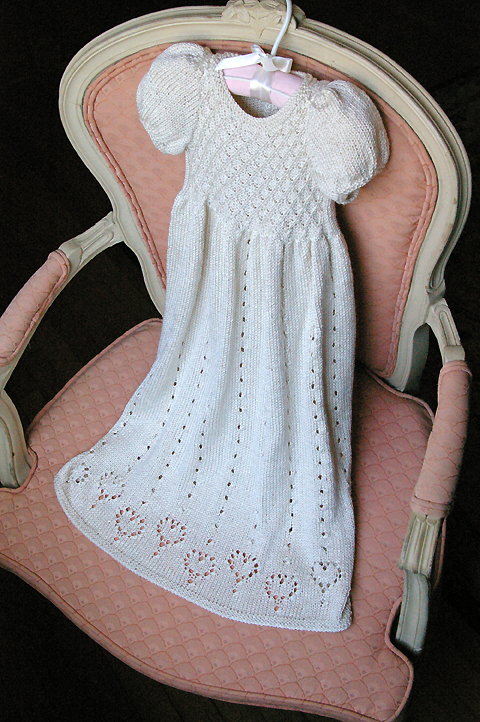 It also includes details for a Christening Gown version, as shown below. Click here to view all the details on the ravelry pattern page. What I am most proud of is taking the time, basically the whole year, to learn the craft of pattern writing and testing, and making the end product professional and well designed. My husband is a partner in a software development company, Droidlinx, which develops for the Android Market, and had commented recently that the Market is like the “Wild West” – full of everything from total charlatans, to the best and brightest. It can be tricky to sort out who’s who. I have noticed that this analogy works for the ravelry designer stores as well. I saw wonderful, talented designers whose fan mail for some patterns that was consistently great, and then some designers that seemed well intentioned, but the project notes were fraught with frustrated complaints and pattern pages loaded with corrections. That’s why when I started out designing, I felt I had to “do it right”. Like learning any new craft, I started with a few patterns that were less complicated, my Silk Tipped Toddler Tee for example, and then began working up to more detailed construction as in the Baby Rock ‘n’ Rollneck. I took my time, and paid attention to all the details, and was grateful for my testers’ comments and support. Along the way, I crawled the ravelry groups like crazy to see what can go wrong, and how to make it right. I studied the Craft Yarn Council’s recommendations, and made sure to delve into my own pattern collections to discover what I felt was good, bad, or ugly about the published patterns I had used. So here I am, officially a designer, and very happy about it!! P.S. Special Thanks to “Wife Mom Knitter” who polished off her beautiful test knit in time to launch the pattern for blog week. WOW what a gorgeous dress! I especially love the modeled shot – so cute! So pretty! I love these. Those dresses are really nice. congratulations also on making the move to designer. What a gorgeous dress! I barely get my knitting done as it is-I doubt that I would ever have the patience to design anything but I appreciate those of you who do. I have a new granddaughter due to arrive in July so this may be on my needles this spring(when I finish the 3 projects already atarted!!!!!) Thanks for your hard work! Thank you for your very thoughtful post about how hard it is to design well and write good patterns. I’m sure some people think it just “happens.” Your designs are beautiful! Keep up the good work! That dress is just too cute! This is a really beautiful design and I appreciate all the time and hard work you put into it. Thanks for sharing! It’s a wonderful princess dress any little girl would love it! The added bonus of making it a christening dress is impressive. It’s really pretty! Love it! 🙂 Now I wanna see it in person!